Definition at line 28 of file CQReportDM.h. Definition at line 23 of file CQReportDM.cpp. Definition at line 33 of file CQReportDM.cpp. Definition at line 49 of file CQReportDM.cpp. References COL_NAME_REPORTS, COL_ROW_NUMBER, flags(), FROM_UTF8, CCopasiRootContainer::getDatamodelList(), CCopasiObject::getObjectName(), CQBaseDataModel::isDefaultRow(), and rowCount(). Definition at line 38 of file CQReportDM.cpp. Definition at line 92 of file CQReportDM.cpp. Definition at line 144 of file CQReportDM.cpp. References ListViews::ADD, COL_NAME_REPORTS, CQBaseDataModel::createNewName(), CCopasiRootContainer::getDatamodelList(), CReportDefinition::getKey(), CQBaseDataModel::notifyGUI(), ListViews::REPORT, and TO_UTF8. Definition at line 210 of file CQReportDM.cpp. References C_INVALID_INDEX, CQMessageBox::confirmDelete(), FROM_UTF8, CCopasiRootContainer::getDatamodelList(), CCopasiVector< T >::getIndex(), CCopasiObject::getObjectName(), CCopasiDataModel::getReportDefinitionList(), CQBaseDataModel::isDefaultRow(), and CQBaseDataModel::removeRow(). Definition at line 160 of file CQReportDM.cpp. References CCopasiDataModel::appendDependentTasks(), ListViews::DELETE, CCopasiRootContainer::getDatamodelList(), CReportDefinition::getKey(), CCopasiDataModel::getReportDefinitionList(), CQBaseDataModel::notifyGUI(), pTask, CCopasiVector< T >::remove(), and ListViews::REPORT. Definition at line 29 of file CQReportDM.cpp. Referenced by data(), and CQReportsWidget::deleteSelectedReports(). Definition at line 114 of file CQReportDM.cpp. 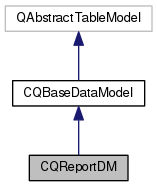 References ListViews::CHANGE, COL_NAME_REPORTS, CQBaseDataModel::createNewName(), data(), CCopasiRootContainer::getDatamodelList(), CReportDefinition::getKey(), CQBaseDataModel::insertRow(), CQBaseDataModel::isDefaultRow(), CQBaseDataModel::notifyGUI(), ListViews::REPORT, CCopasiObject::setObjectName(), and TO_UTF8.